It was a war zone, the toddler had laid down the law: She was having mac and cheese for dinner and that was final. Mom and Dad knew they had lost the battle, but not the war! Just because mac and cheese was too be had didn't mean we couldn't sneak some veggies in there and maybe even (gasp) some fun new flavors: Beer-ca-roni was born! A great meal, full of yummy good stuff, kid friendly and SUPER re-heated in the microwave for a quick weekday meal Home Brew Mac n' Cheese is a favorite around these parts and, lucky you, I've decided to give you the recipe! Some pics to break down the concept and the full recipe is at the end. Enjoy! Get a medium sized stock pot and put it on the stove over on medium heat. Add 2 tbsp butter, once melted add sugar, salt and pepper. Once butter starts to bubble add carrots, stir to coat in butter and saute for a minute or too. Then add beer, bring to a simmer, cover and forget about it while preparing everything else. Perhaps move it to a back burner to simmer. Put a stockpot of water on to boil for pasta. Get a large skillet and melt butter and oil together over medium heat. Add garlic, onion and salt and saute until they start to brown. Add mushrooms and continue to saute until everything is nicely browned. Then add peas and cook until warm throughout. Cover and set aside. By now your stockpot of water should be boiling, add pasta and cook as directed on box. Get another large skillet (or transfer veggie mixture and reuse previous skillet) add 2 tbsp butter, and melt over medium heat. Once butter begins to sizzle/bubble slowly add flour while whisking. 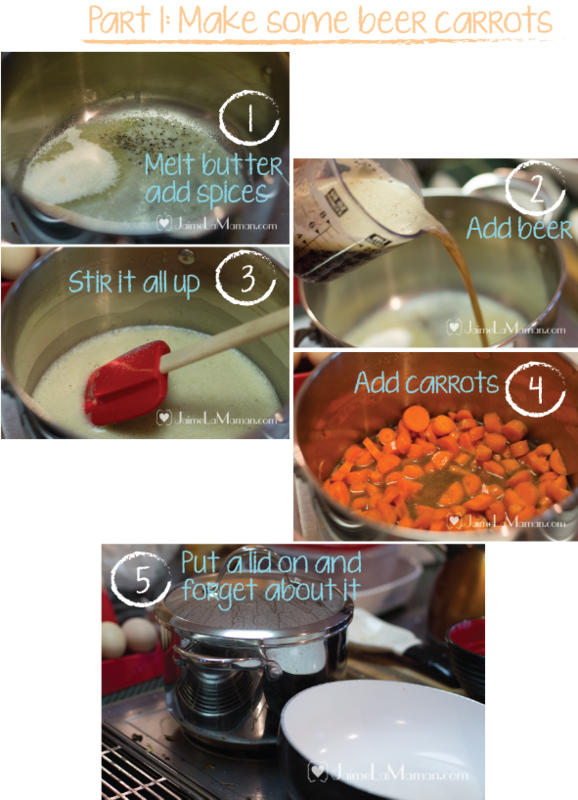 Whisk constantly until the roux takes on a nice reddish brown color (called a "brick roux"). Add beer and milk, continue whisking until mixture thickens slightly, mixture will cling to the sides of the pan and be noticeably thicker but will NOT get so thick that it pulls away from the bottom of the pan. Once desired thickness is achieved add in cheeses and stir until melted. Remember those carrots from step 1? They should be nice and tender by now, try one, if its good and soft then drain out most of their liquid and combine everything in a large bowl: Pasta + cheese sauce + veggies + carrots. Obviously if the carrots still have too much bite/snap to them, continue simmering until they are ready.